Hallomall Upgraded Special flickering flames design Solar Lanterns for you! 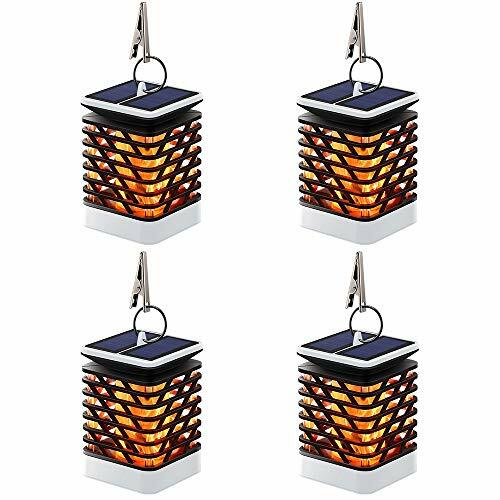 ◆ A great decoration for you house, Hanging this solar flame lanterns around your house or place them on the tree at your garden, it will show your hospitality to your guests. ◆ Delightful flickering flames design, appears a lifelike flames when using, 75 flash warm white led will establish a charming ambiance. ◆For best results, charge the battery fully the first time you use the light. 【Realistic Flame-like Hanging Lantern Light】75LEDs flame-like illumination, wonderful decoration to outdoor events and areas such as pool, garden, house, umbrella and pathways etc. 【Easy To Install&Absorb Sunlight】No wires needed, simply place it anywhere you like with clip. Top-mounted solar panel for charging through sunlight, turns on automatically at night. 【Energy Saving & Environmental Protection】Built-in 1500 mah solar rechargeable battery. Push ON/OFF button at the bottom of the light to better control the light. 【What You Get 】Solar outdoor lights with 1-Year Manufacturer's Warranty and 30 days no-questions-asked return policy. Please be free to contact us at support@hallomall.net and we will give you a satisfactory reply within 24 hours.